Not all travel is glamorous. Not every trip seeks adventures and “the exotic.” Some trips are more rough around the edges — not because one stays at a hostel or camps in the woods. Not because we buy fancy outdoor gear for “roughing it” and take a guidebook along with us into the controlled unknown. Some places ruffle our feathers just enough to make one feel uncomfortable; it’s a welcome feeling, one that those eager to learn about the world actually seek out. 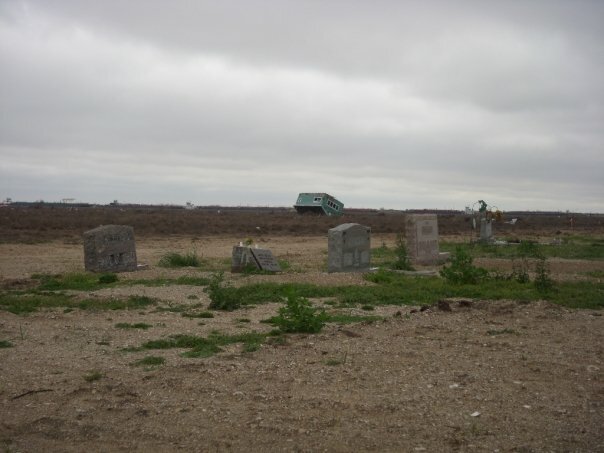 Today’s guest blogger shares her experience on an alternative spring break trip to Texas, post-Hurricane Ike, and explains what it feels like to go from an excited college kid ready to help, to a volunteer scraping mold and decay off of the walls of what was once someone’s home, sweet home. It was a foggy day in Galveston, Texas, but the other student volunteers and I were smiling and laughing. We were clad in hazmat suits, which made us feel like clunky spacemen on a mission. But we weren’t headed to space. 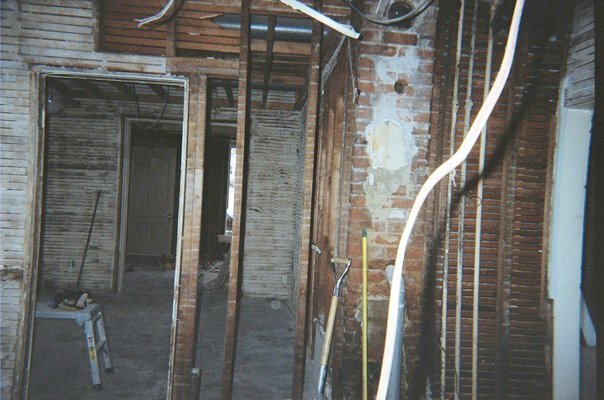 We were about to gut a small house that had stewed untouched since Hurricane Ike hit Galveston about seven months prior. 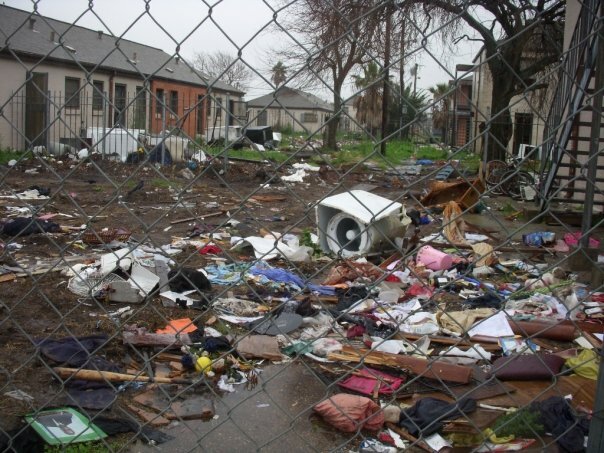 Flood waters had ravaged the neighborhood we stood in, leaving it full of empty houses and overflowing dumpsters. But my friends and I were taking photos of ourselves and goofing around. For the time being, we felt good. 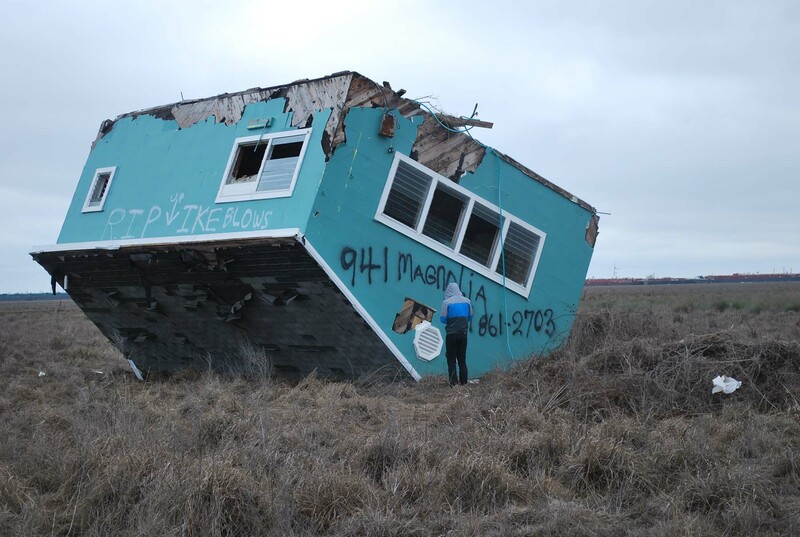 Overturned house in Galveston, Texas. Photo provided by Katie W.
We were in Galveston for Emerson College’s Alternative Spring Break (ASB). Rather than go on our own vacations, we decided to apply to build houses, feed the hungry, or clean beaches. In 2008, a freshman, I went on my first ASB trip to Waveland, Mississippi, to work on Hurricane Katrina relief. And then I was hooked. Since then, I have journeyed to Galveston and Cedar Rapids, Iowa for flood relief. This year, after months of working on the trip-planning, fundraising leadership team, I’m headed to Pensacola, Florida to work on wetland restoration, and I couldn’t be more thrilled. Each trip is a unique, perspective-altering journey that is incredible to experience but difficult to describe. But I’ll try. House in Galveston, Texas. Photo by Katie W.
Let’s go back to that house in Galveston. Before Hurricane Ike, it was inhabited by an elderly woman. We volunteers didn’t know much about her, but on that monochromatic day, we took her personal belonging from her home and set them on the curb, turning this woman’s life – her photos, her fish tank, her little statuettes – into a pile of water-rotted garbage. We’d all gutted houses before, but only when they had already been stripped. 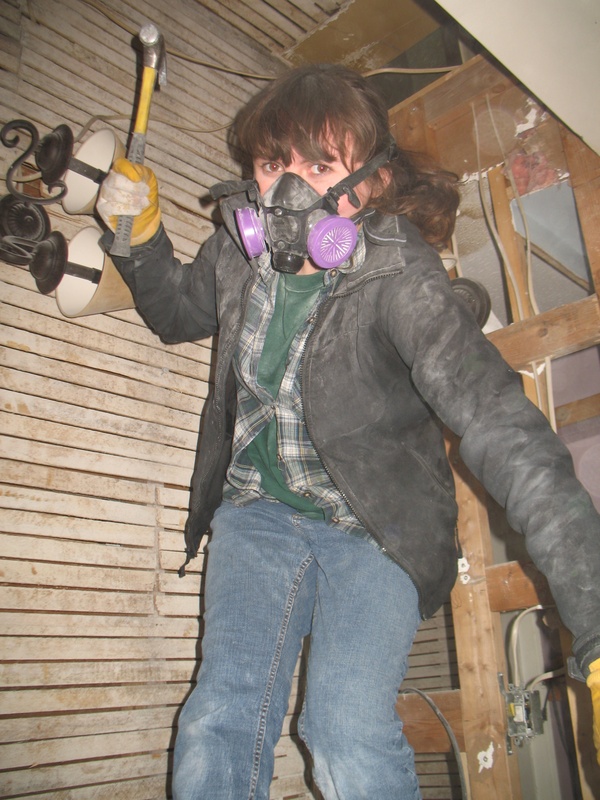 Then it was fun – tearing into drywall, hammering toilets to pieces. But this house had a personality. Soon into the job, we stopped goofing around. We needed the hazmat suits to protect us from the extreme mold in the house. Two students squeezed a soggy, stinking mattress through front door. Bugs scurried across the walls when we removed pictures from their nails. The refrigerator – unopened for months – sloshed dangerously as we carefully lugged it outside. Even through our masks, we could smell the decay. We were utterly silent. On the front lawn, I approached one of my friends who was standing totally still, looking stricken. She pointed to the grass, where the body of a cat lay flattened and gray. No one joked. Debris in Galveston. Photo by Katie W.
I describe this day not because it was sad – which it was – but because it will never leave my memory. I frequently imagine who this woman was, where she ended up living, what has become of her house now. These are things I’ll probably never know. This woman, or whoever lives on the property now, will never know me. But we’re connected somehow. And the other volunteers and I, while laughing about the frustration of a particular patch of drywall or while holding back tears to avoid steaming our goggles, all formed a bond of our own. We grew closer to members of our college community while serving a community miles and miles away. We experience a side of life and a type of work that was utterly different than what we – aspiring filmmakers, writers, and actors – did in our normal school-week. Gutted house in Cedar Rapids, Iowa. Photo by Katie W.
There is no way to quantify the impact that service trips have. Sure, this many houses are built, this many pieces of trash are cleared. But the links formed between people cannot be measured. When my Waveland group went out to dinner in a local restaurant one night, a middle-aged couple approached our table. Teary eyed, the woman thanked us for being there, for not forgetting them, for helping though we didn’t know them. Alternative Spring Break teaches people to care and reminds others that they are cared for. It puts life into perspective. And that’s something wonderful. Photo of Katie Woods during ASB trip. Katie Woods is a senior at Emerson College, earning her BFA in Writing, Literature, and Publishing. She is the Student Coordinator for Alternative Spring Break through the Office of Service Learning and Community Action. Her favorite place to travel is the redwood forests of Northern California. You can help her and the other volunteers go on this year’s trip by donating here. Yeah, isn’t it? Thanks for checking it out. What a great story about service! Good luck on your trip to Florida!